Technology is a critical component of any successful meeting. 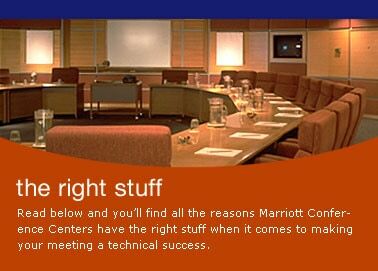 Marriott Conference Centers give you the latest high-tech options and meeting planning services for assembling participants from around your region or around the world. From high-speed Internet access to producing sophisticated audiovisual presentations to business services that rival any the home office provides. Marriott does it all. Security Satellite Videoconferencing permits live communication of participants. Real-time video can be enhanced with computer graphics or prerecorded video. Marriott is the only lodging company that has this technology at work, supported by a network of steerable satellites. We're experts. And with expertise comes superior service. Marriott Conference Centers provide unprecedented levels of connectivity at T1 speed. The simple to use "plug-and-play" system delivers connections 300 times faster than dial-up modem services. No special equipment is required. Users plug directly into the STSN data port via USB of ethernet cable. The benefits go well beyond speedy access, too. Since each hotel maintains a customized informational Web site, users can input and access information at will. Guests can check out amenities, recreation, and business services or investigate local area attractions. Count on Marriott to supply the equipment and staging for your show-stopping presentation. Our trained professionals can advise and assist you at every turn. Check individual properties for a complete listing of available technology and other meeting planning services.